The 2018 midterm elections are tomorrow and in addition to exciting changes to the political landscape, the day promises to bring millions of voties, pictures of completed ballots posted to social media, and simultaneously, confusion at a national level over whether they’re legal or not. It depends on which state you’re in — so fear not and consult this map! Or the handy color-coded list below. Now, some of you may be wondering why would it be illegal for someone to express their political opinion by sharing how they voted. Well, the problem isn’t that you are engaging in political speech, which is of course protected, but that you are publicly displaying your actual vote when the election process specifically prohibits that. Secrecy in voting is meant to be empowering, not limiting. If no one knows how you vote and it is in fact illegal to provide proof one way or the other, you can’t be coerced or threatened into voting a certain way. In addition to this possibility, there is the more general threat of having recording devices active in a polling location where others may not want to have their voting process documented. Essentially the integrity of the democratic process and the possibility of infringing on the private votes of others has been decided by some states, and not without considerable discussion and dissent, to take precedence over the free speech of the individual in this specific location and time. As exceptions to the First Amendment go, it’s a pretty narrow one. Here’s a big version of the map to download and share. All told, 18 states prohibit the practice, with varying degrees of breadth and severity. It might be a low-level misdemeanor or a more serious offense; it might be a blanket ban on electronics in the polling places; there might be a legal challenge of the law; the state may be vigilant or never care to prosecute… but I’m simplifying them all to “illegal” because one way or another it’s against the law there on this election day. 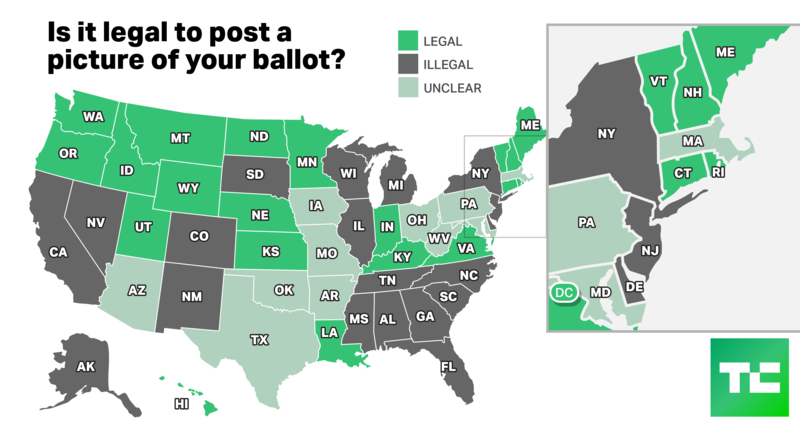 21 states either have no law prohibiting the practice or explicitly allow it, making it “legal” assuming the picture is of you and/or your own ballot and not of someone else and theirs. The remaining 11 states don’t fit neatly into either category. For instance, in some states you can freely share pictures of your completed mail-in ballot but taking photos in or around polling places is disallowed. It’s not just unclear to me, but to lawyers and lawmakers — generally speaking, though, there’s some way to break a law with a votie. If you’re in an “unclear” state, the safest thing is not to do it, but if you must, check out the specifics at the bottom of this list at Law & Crime. If it’s illegal or questionably legal in your state, file a votie at your own risk! Using your phone to document voter suppression, malfunctioning voting machines and other problems is a potential exception to the rule. Use your best judgment and respect the privacy of others. I am not a lawyer and this is not legal advice! This article is strictly informational and correct to the best of my knowledge as of November 5, 2018. Is something incorrect? Let us know in the comments and I’ll look into it! We already fixed some stuff. And no, I’m not going to stop trying to make “votie” happen. It’s going to happen!